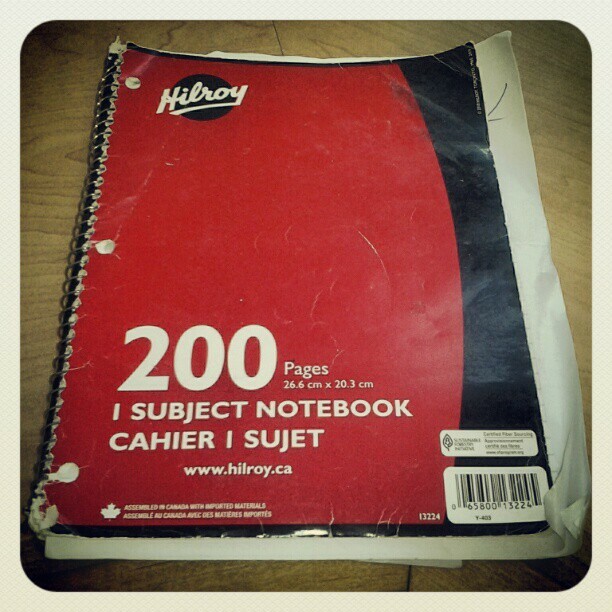 This is the Notebook. (pls to be noting the capital letter. it really IS that important.) This is the Notebook that holds most of the secrets to my NaNo novel (and its sequels). And, after months of ignoring its existence, I have finally buckled down and looked for it, so that I can finish my NaNo once and for all. I'm a little afraid to open it. What if it hates me for ignoring it so long? What if it remembers the abuse I put it through in November? What if it knows that I've been cheating on it with another notebook? (one that's prettier and younger than this one is). What if it actually DOESN'T contain all the secrets to finishing my novel? What if I'm totally lost and IT NEVER GETS BETTER?!?! I've also started trying to actually READ what I wrote in November...I'm undecided on how it's going. There's a lot of anxiety in reading my own work, I find. I know I'm a good writer, but for some reason I can't quite SEE it right now. I'm also becoming increasingly more worried that I'm going to have to completely re-scene the first few chapters, because while I feel it sets up the world and characters rather well, I feel like the action doesn't begin quite early enough. I'm considering just skipping ahead to some more exciting parts and starting my edits there, and working my way back after they're done. What do you guys do? I can use all the help/advice I can get. I understand your problem... I finished my NaNo project at the end of January at about 95k, aka 200 pages in Word. I've re-read/edited 20 of those pages, a good month ago. I haven't looked at it since, though I think about it very often. One reason is that I'm simply busy. The other reason is that I've realized that while writing/drafting was fun, rewriting/editing is actual WORK. I have to second guess myself. Is this scene good? Necessary? Is it too long/short compared to that other scene? What about the overall pace and suspense? Should I skip a part and tell is as a flashback? Are my characters believable? YAY! My first comment on my writing blog. And I totally agree. While writing felt a lot like work at the time, editing is much, MUCH harder. It needs to be done though, or this book will never see the light of day. Good luck with your own book, Carmen! 95k is REALLY impressive.